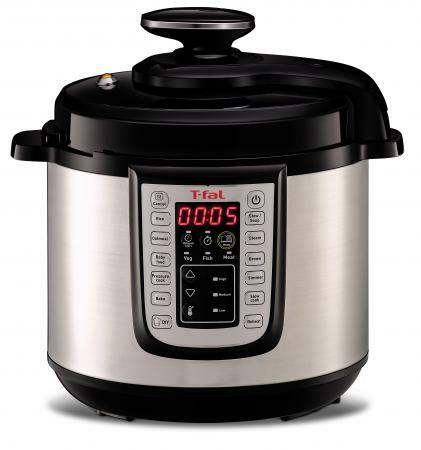 If you like the idea of an electric pressure cooker rather than a stovetop model, the T-fal Electric Pressure Cooker is a good option to consider. It has a six-quart capacity, so you can prepare quite a few servings at one time. It also has a locking lid that seals completely as well as controls that are well-placed and easy to read. You can use this small appliance to cut down cooking time for a cook a wide variety of dishes, including recipes designed for other types of pressure cookers and multi-cookers. The timed cooking and delayed start options are particularly helpful for those looking to consolidate meal preparation. The Good Housekeeping Institute (GHI) reviewed this electric pressure cooker in November of 2017, along with nine other similar small appliances. GHI declared the T-fal model as "a top performer" in its stew preparation category. GHI also noted that the appliance reaches pressure quickly, though some Amazon reviewers indicate that it takes this device longer to achieve pressure than the Instant Pot. I can't speak directly to that comparison, as I have never used an Instant Pot. GHI also points out that this device is "quick to release pressure naturally." The instruction manual that comes with this small appliance is not the most helpful document and, as GHI points out, its "controls aren't intuitive and require experimentation." While you should definitely read the manual that comes with the device before you use the appliance, you may also find it helpful to seek additional how-to information. I am not an experienced pressure cooker user, so that's exactly what I did. I found this guide to getting started with your new electric pressure cooker to be beneficial, as well as a YouTube video (below) for a slightly different model. One of T-fal's company commitments focuses on "producing high quality products ... that allow healthy and tasty cooking." That's exactly what their electric pressure cooker provides. It's a great option for busy home cooks who need versatile kitchen appliances that help them prepare delicious meals with minimal time and fuss.